Update: The third edition of the XML in a Nutshell has been published. I'm keeping this page here to support readers who bought the first edition, as well as for readers of translations, since many of the translations are still based on the second edition. However, if you want the most current information, you should go to the third edition page instead. It is substantially improved over the second edition with lots of new and updated material. New topics include XML 1.1 and XInclude. It is completely up-to-date with the state of the art in XML as of 2004. If you're buying a new copy, you'll want to make sure you get the third edition. The third edition has black ribbon across the upper-left hand corner saying "3rd Edition". One of my favorite comments about The XML Bible came from a reader in Norwich England who wrote on amazon.co.uk, "It would seem to me that if you asked the author to write 10,000 words about the colour blue, he would be able to do it without breaking into a sweat." You know, I probably could write 10,000 words about blue; but I can write short books too, and XML in a Nutshell is the book that proves it. I'd estimate that it covers over twice the material that the XML Bible does in less than half the space and at just about half the price. (Whether I can write this concisely without the able aid of my coauthor W. Scott Means is still an open question.) In fact, XML in a Nutshell even weighs less than half what the XML Bible weighs, so not only will it not break your budget; it won't break your back either. I still like the XML Bible . I think it's a good book, but even I have to admit that I think twice before packing it in my carry-on luggage. XML in a Nutshell, 2nd edition , is a complete introduction to the state of the art in XML as of mid-2002 including elements, attributes, entities, well-formedness, DTDs, schemas, namespaces, RDDL, XLinks, XPointers, XPath, XHTML, XSLT, XSL-FO, SAX2, DOM2, JAXP, TrAX, Unicode, and more. Very few XML books even attempt to cover this much material, and I guarantee you that none of them do it in this few pages. 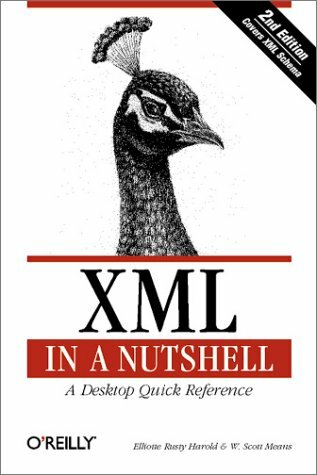 There is simply no quicker way to learn everything you need to know about XML than by reading this book. It is the most concentrated, cost-effective way to educate yourself about XML. For those readers who've already learned everything you need to know about XML, I know of no better reference to remind you of the things you've forgotten. Part IV contains detailed references for XML, XSLT, SAX2, DOM2, XPath, Schemas, and Unicode; all carefully designed to facilitate fast look-up when you just can't quite remember the name of that XSLT element or the exact signature of that SAX method. Before Scott and I wrote this book, I wasted way too much time searching the specifications of XML, XSLT, DOM and more for little details like the proper namespace for SVG. Now I just flip open XML in a Nutshell , and the answers I need are right there. We wrote the reference work we always wanted to have. If I've succeeded in piqueing your interest, you should be able to find XML in a Nutshell at almost any bookstore that carries computer books including the online bookstores, Amazon.com, Barnes & Noble, and Powells. If you need to special order it, the ISBN number is 0-596-00292-0. It's $39.95, published by O'Reilly, and written by Elliotte Rusty Harold and W. Scott Means.